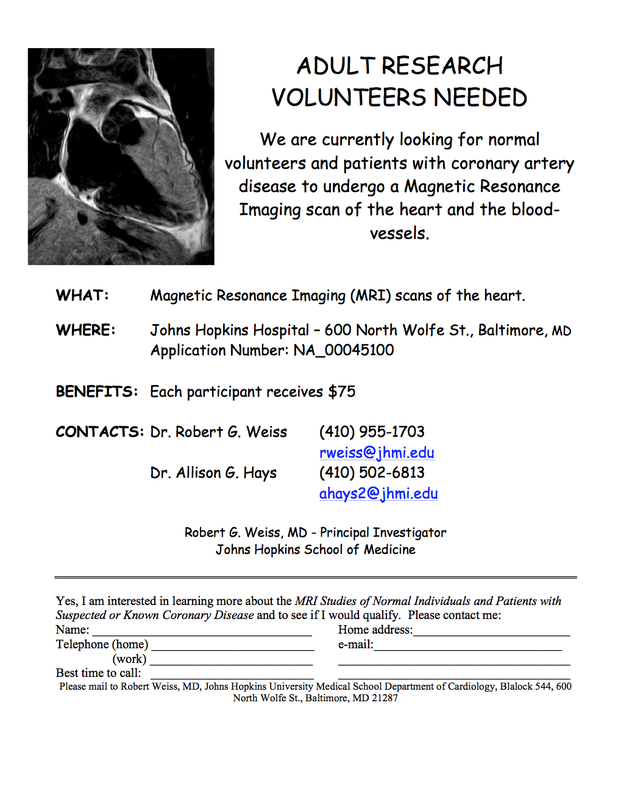 If you are a healthy volunteer or a patient with coronary artery disease, and are willing to participate in an MRI study, please see our IRB-approved flyer (below). Use the form below to enter your contact information. If you have any questions, please contact Sahar (sahars@jhu.edu). Each participant receives $75, a garage/valet parking coupon, and a $10 meal coupon for Cobblestone Cafe. A .pdf version of this flyer is attached at the bottom of the page. Please feel free to print it out and/or distribute to anyone who might be interested in this study. Interested in volunteering for NA_00045100? Just fill out the form below and click "Submit." Your answers will be reviewed by the study's research coordinator. If you qualify for the study, the research coordinator will contact you directly. Thank you very much!